The recently released DataTale SMART 4-bay Thunderbolt RAID caught my attention as an affordable Thunderbolt storage unit for video editing so I contacted Oyen Digital here in the Twin Cities and they sent over a unit for me to review*. I supplied my own 2TB Toshiba 6Gb/s 7200rpm drives (four of them) that I bought at MicroCenter. 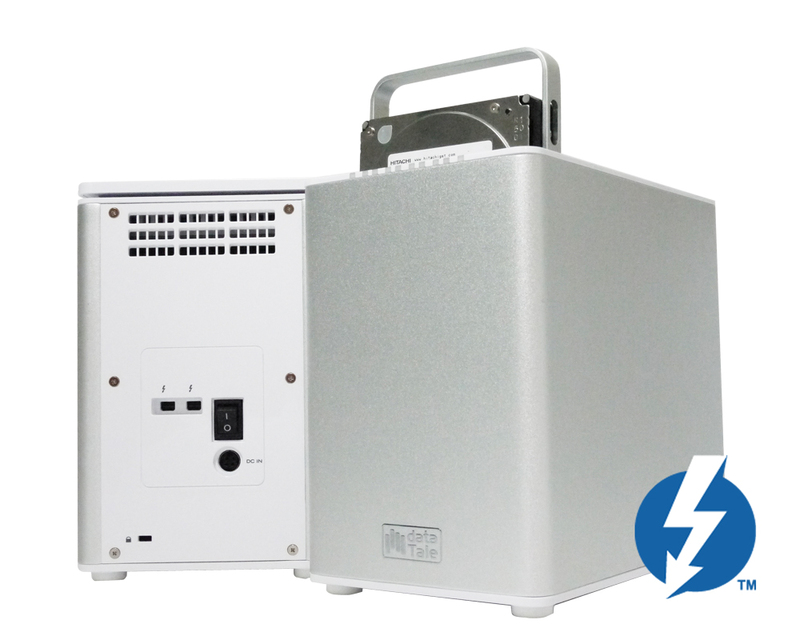 This is a compact, well-built, whisper quiet, and affordable Thunderbolt RAID that is quick and easy to setup and use. After using it for two days I’d recommend it to anybody looking for an affordable and compact Thunderbolt RAID in their home or studio setting, with particular focus on the video and commercial photography industry. Indie filmmakers should find it quite excellent. In RAID 0 mode I found 7.5 TB of space (out of 8) with speeds reaching 600 MB/s. Impressive. Would SSDs bring even higher throughput? I’d imagine so. In RAID 1 mode (two pairs of 2TB space) I found speed reaching about 180 MB/s on read and write. In RAID 10 mode (4 TB of space), which offers speed and redundancy, I was impressed with write speeds of about 260 MB/s and read speeds reaching 360 MB/s. RAID 10 can have two drives fail without losing data, as long as they aren’t two of a pair, and seems to be a nice balance of speed (although slower than RAID 0) with redundancy (like RAID 1). I’m going to leave the unit in RAID 10 mode and put it to task with video editing to see how it holds up. So far, so good. 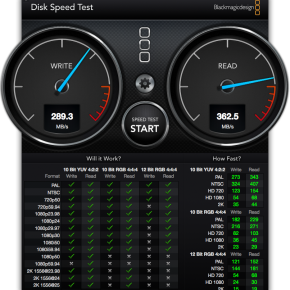 The DataTale Thunderbolt RAID can also run as JBOD and HyperDuo mode. In HyperDuo mode you’d use three SSDs and one HDD to create the performance similar to Apple’s Fusion drive. One thing to note, if you have your display at the end of your Thunderbolt chain, it won’t work if the RAID is fully powered off. You can dismount the drives, but powering off the unit does power off the rest of the Thunderbolt chain. 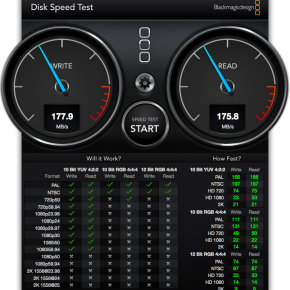 Check out the DataTale Thunderbolt RAID for your speedy storage needs. I am eager to see what they come up with next. 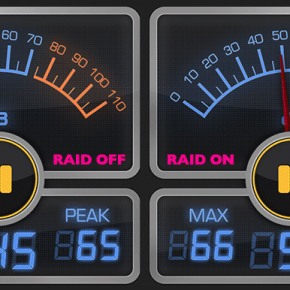 Just keep in mind, RAID is not backup (thanks, @PeteBocken). *Disclosure: Oyen Digital has provided me with a DataTale Thunderbolt RAID chassis for purposes of providing a review. I received it at no charge to me and I am under no obligation to return the product. I will attempt to keep this post updated with on-going performance notes, good or bad. Over the weekend, during which I was not editing, one of the Toshiba drives in the unit started making a clicking sound about once a second, but intermittently. I assumed it to be the click of death. The RAID Master software did not indicate there was a drive problem, nor did the status lights on the front of the unit. Still, I know that sound means problems so I yanked the offending drive out of the bay. To my pleasure, the unit kept right on working at full speed, but when I replaced the drive into the unit it showed up as a single drive (as expected) that was verified to be failing (via Disk Utility). I exchanged the drive for a new one at MicroCenter (easy and nice customer service) but then could not get the RAID Master software to fully recognize the unit. A quick call to customer service found that a reboot of the computer would clear it up and I was back in action. The unit and drive were recognized and I was able to initiate the RAID Rebuild. I expected the rebuild to be quick (these are pretty fast drives, after all), but I started it at 12:05pm and it was only at 18% at 2:22pm. Near as I can tell from spot checking, it took slightly more than 12 hours to rebuilt the RAID, which was nearly empty. We need faster RAID rebuilds. It would have been much faster to delete the entire RAID and recreate it. Yes, as Pete says, RAID is not backup. The other discovery I made is that the RAID Master interface is lacking some features that I glossed over during initial setup (it was a fresh system, I didn’t expect to see much there). I was unable to get emails based on system Notifications working, which would certainly be useful if a drive went bad. And the Logs don’t quite appear to be fully functional either. I would say these omissions, as well as the lack of hardware failure indications via the status lights, are a huge liability in the current software. I would deduct at least one and a half stars from a 5-star review for this. OK, the RAID Master software has been updated to apparently fix the issues I had previously with missing Notifications and Logs, both features appear to be working as expected these days and the DataTale unit has been performing excellently. I have modified my rating back up to 4.5 stars and would still recommend this unit to freelancers, editors, or anybody needing quick and reliable TB storage. I’d love to see this unit get a Thunderbolt 2 upgrade and a RAID-5 option, but I’ve been quite pleased with the performance and have been editing Sony F5 footage in FCPX without any restrictions. I’ve also moved it over to a new Mac Pro and it was also seamless to do so. All is still well, with latest updates of OS X, FCPX, RAID Master, etc. Still in daily use for project storage and editing. 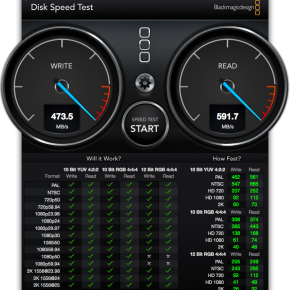 Even with the drives pretty full, still seeing read and write speeds in the 250 MB/s range.